This article is about O'Conor Don clan. For other uses, see O'Connor (disambiguation). 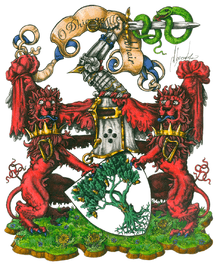 O'Conor (Middle Irish: Ó Conchubhair; Modern Irish: Ó Conchúir), is an Irish Gaelic Aristocratic catholic Family who are the historic Kings of Connacht and the last High Kings of Ireland before the Norman invasion. The family seat is Clonalis House outside Castlerea in County Roscommon. The O'Conor family can trace their lineage back to the 5th century without dispute but through folklore and mythology to Adam. The clan name originated in the 10th century as a derivative of its founder Conchobar mac Taidg Mór. The family contributed to Irish society in art, history, language, politics, diplomacy, etc... before and during colonial rule in Ireland.They descend in the paternal line from the Connachta's Uí Briúin Ai. The current O'Conor Don is Desmond O'Conor Don (b. 22 September 1938) who lives in Rotherfield, East Sussex in England. The Ó Conchubhair Donn is the senior head of a lineage which provided about one hundred Kings of Connacht, thirty Chief of the Name and eleven High Kings of Ireland, the last of them being Tairrdelbach Ua Conchobair (1088–1156), and his son Ruaidrí Ua Conchobair (c. 1115–1198). During the late 14th century, the Ó Conchubhair dynasty grouped into two main divisions, one led by Toirdealbhach Ruadh, the other by Toirdealbhach Óg (also called Toirdealbhach Donn), both in the seventh generation of descent from Cathal Crobhderg. From these descended the families of Ó Conchubhair Ruadh and Ó Conchubhair Donn, the former died out. The great Irish scholar John O'Donavan once said of the O'Conor's.... "No family in Ireland claims greater antiquity and no family in Europe, royal or noble, can trace its descent through so many generations of legitimate ancestors." On the death in 1981 of Rev. Charles O'Conor Don SJ, Clonalis House, the ancestral seat of the O'Conor Don Family, passed to his sister Gertrude O'Conor Nash. Consequently, not for the first time, the family title and family seat were separated, remaining within a more direct O'Conor family lineage. The O'Conor Nash family now reside at Clonalis House where they maintain the O'Conor archives. Toirdhealbhach Óg Donn mac Aodha meic Toirdhealbhaigh, d. 9 December 1406. Cathal mac Ruaidhri Ó Conchobhair Donn, d. 19 March 1439. Aodh mac Toirdhealbhaigh Óig Ó Conchobhair Donn, d.15 May 1461. Feidhlimidh Geangcach mac Toirdhealbhaigh Óig Ó Conchobhair Donn, d. 1474 – last fully recognised King of Connacht. Tadhg mac Eoghain Ó Conchobhair Donn, d. 1476. Eoghan Caoch mac Feidhlimidh Gheangcaigh Ó Conchobhair Donn, d. 1485. Aodh Og mac Aodh Ó Conchobhair Donn, died ? Conchobhar mac Eoghain Chaoich Ó Conchobhair Donn, d.? An Calbhach mac Aedh Ó Conchobhair Donn, d. 1654 – popularly inaugurated king in 1643. Hugh Óg mac Aedh Ó Conchobhair Donn, d. 1662. Matthew O'Conor Don, 1773–1844 – popularly acclaimed 'king' in the 1830s. ↑ Curley, W. Vanishing Kingdoms. Dublin. Lilliput Press.